Raw Chocolate by Sacred Chocolate: The Latest Word on SuperFoods: Raw Chocolate! Sacred Chocolate: Raw, Stone-Ground, Organic & Vegan > The Latest Word on SuperFoods: Raw Chocolate! To get the password for this file just sign up for our free newsletter. If you have found this page while surfing the Sacred Chocolate website, you have struck gold! 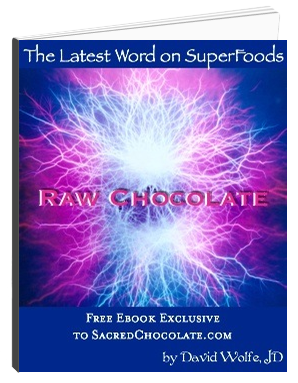 You may freely receive the e-book entitled "The Latest Word on SuperFoods: Raw Chocolate" by David Wolfe. Just enter your email below!